Composer’s out-of-the box DFS integration is currently aimed at the Developer with simple, as opposed to advanced, requirements for DFS. Specifically, we’re talking about developers that only care about the services themselves (the basic developer) and don’t care about the package that the services come in (the advanced developer). And for a lot of use cases this out-of-the-box capability is just fine. However, there are some other use cases where you do care about the package that the services come in. Perhaps you want to package everything in a war rather than an ear (because you use Tomcat for example). Or perhaps you want to run some additional servlets or servlet filters alongside your services (or even JSPs!). Or perhaps you have custom authentication and authorization requirements and you want to replace DFS’s authorization SOAP handler with you own. Any of these types of requirement will mean that you care about the packaging your services come in as well as the services themselves. Fortunately, the Java EE edition of Eclipse can help us out. It adds new projects types such as the Enterprise Application project (ear project) and the Dynamic Web project (war project). These projects will give us complete control over the contents of the ear, war & jars’s. 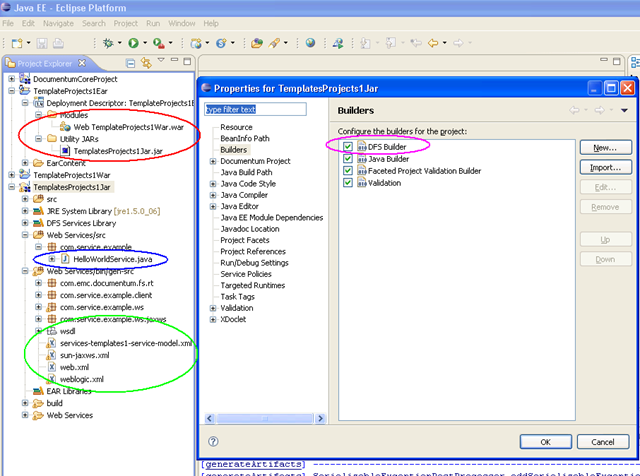 To compliment this it is possible to install the Composer plug-ins right into this edition of Eclipse as I talked you through here. This is a pre-requisite for this article. With the union of these two products we can now do some cool things like create Web projects with DFS services in them. We can also significantly boost our productivity by leveraging Eclipse’s capability to deploy and test our ear and war projects on an associated application server, without having to ever leave the IDE. 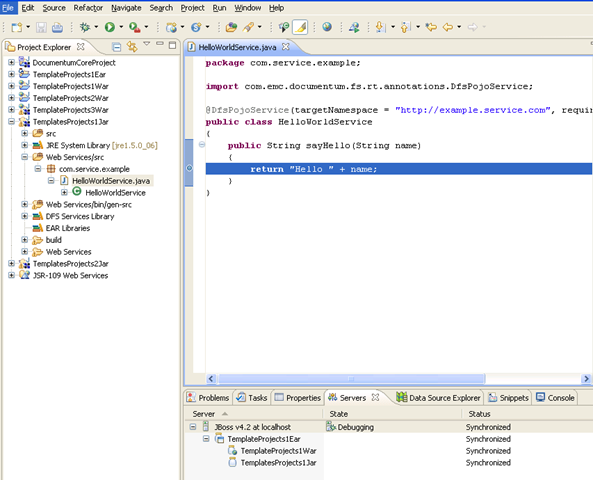 Eclipse supports most, if not all application servers either out of the box or via download. To get you started I’ve created an attached a few blank templates projects which should give you the idea. You’ll notice that I’ve ringed the Ear associations in red. The source file for a sample service in blue. The generated web resources for the service (the wsdl, reference web.xml, app server specific config files, etc) in green. Note these files in particular. My recommendation is that you add a custom ant-based builder that copies (or merges) these files to the relevant locations in your War file. Lastly, I’ve ringed, in pink, the DFS builder so you can see that it exists on the utility (jar) project. With all of these project templates you’ll notice that they are suspiciously devoid of anything DFS related at the moment; runtime, JAX-WS runtime, UCF, etc. I didn’t want to infringe any copyright’s with my employer. I like getting paid :-). So regrettably I will have to leave you this as a reader exercise. Another approach of course would be to import an existing DFS ear that could act as a bootstrap. It’s up to you. But obviously these files need to be applied one way or another before you can think about deploying this to a Server. I have also left out the Documentum Core Project. Again, I didn’t want to infringe any copyright’s so before you import any of these templates make sure you have a 6.5 Documentum Core Project in your workspace. The easiest thing to do is create yourself a dummy Documentum project which will force the creation of the core project if it doesn’t exist. OK. 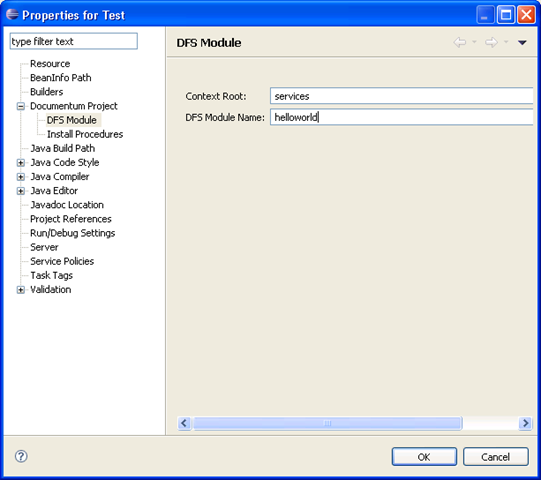 Assuming you have overlayed the remaining DFS files to complete your project structure. You will now want to run or debug it. First-time only you need to configure an appropriate server. In the Server’s view right-click in free space and select New->Server. Follow the wizard through to completion. Typically you will configure a new Server entry based on an existing app server installation but some of the runtimes also support installation of a new app server instance as well, Tomcat being one. Once you have associated your project with your Server all that remains is to Start it or Debug it. Right-click on your server and select either Start or Debug. Obviously if you start your Server in Debug mode (as the above screenshot shows) any breakpoints you have set in your code will cause eclipse to break into the debugger when hit. 1. 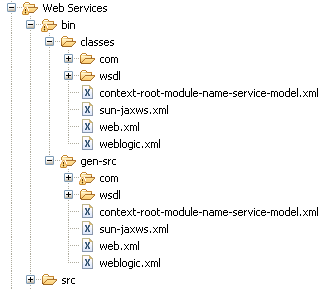 Create your web services source tree. If you want to use the DFS Builder’s defaults you must create folders /Web Services, /Web Services/src, /Web Services/bin/gen-src & /Web Services/bin/classes/. 2. Copy in the following files from a dummy Documentum project; .dmproject, .dfsproject & template. Modify .dfsproject, if required, as outlined in step #1. If you are outputting your source to the project’s default output folder then you can just omit the output attribute altogether. 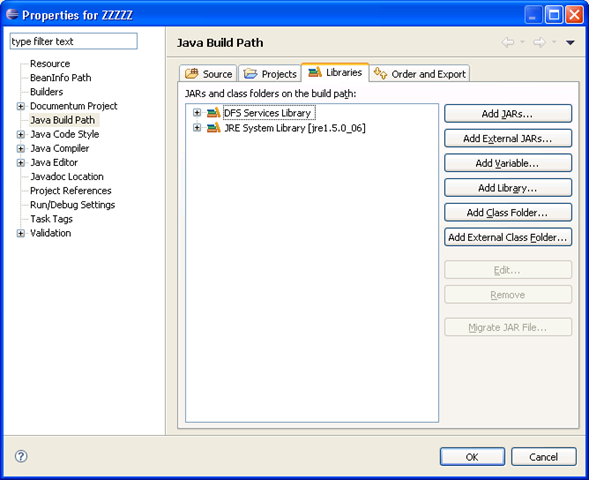 This file determines your Java Build Path so you should be able to see these changes if you inspect the Java Build Path tab on your project’s properties dialog. Some of the other entries may be a little different, especially the natures, depending on the type of project that you are merging into. When you save this file you should see the Documentum logo decorator added to your project and if you inspect the Builder properties tab you should also see the DFS Builder has been added. 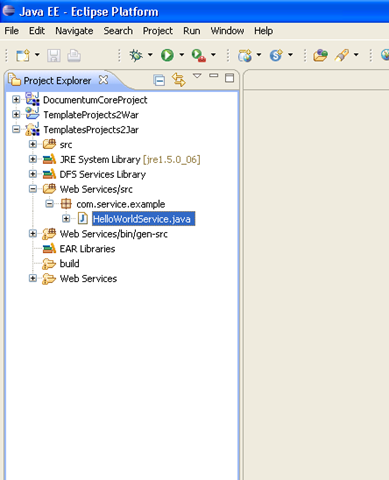 What we have looked at today is a technique for leveraging both Eclipse IDE for Java EE Developers, specifically its WTP features, and Composer in order to develop services within the context of enterprise & web applications. This gives you as the developer complete control over the contents of your DFS package. It also allows you to leverage the full power of WTP’s server runtimes & debugging capabilities. When an “artifact” project is created it also adds all the necessary DFS resources to allow you to develop Documentum services. 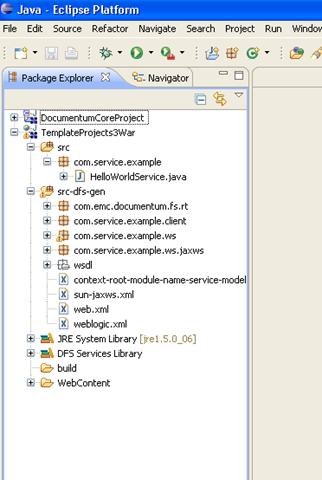 It will deploy a copy of the DFS SDK to your core project (incidentally this is why creating the first project in a workspace takes a little longer than you might expect) and add the DFS Services Library to your project’s java build path. And add a DFS Builder for building your services. 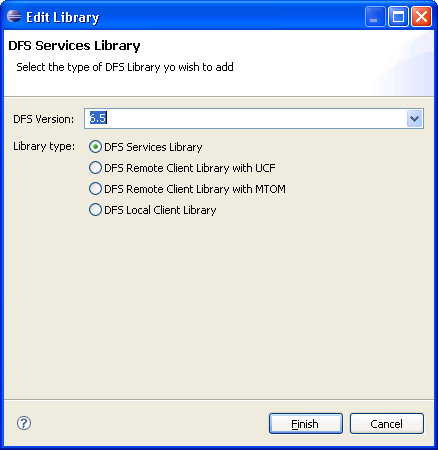 As you can see there are in fact 4 flavours of DFS services library. The first, and the default, is concerned with developing services (today’s topic). The remaining three are actually concerned with developing service consumers. They are pretty self-explanatory. The only one that perhaps requires a little explanation is the last; “DFS Local Client”. You add this type of library to projects that are acting as “functional tests” for your services projects. Typically, you create one or more of these “functional test” projects in the same workspace as your services projects and configure them with this type of library. This then allows you to debug from the client into the service and back again without having to deploy to a server. A useful feature. I will talk more about developing service consumers in a future articles. OK, so back to developing the services themselves. As you can see your project is all set up for service development. Now you need to develop a service. As you will probably all be aware there are a couple of flavours of DFS service; one based on a POJO and another based on a BOF SBO (service-based object). They are, in fact, very similar and are just annotated java classes. You can read more about DFS and its annotations from the DFS developer’s guide. I won’t go into these here. We’ll use the POJO variant here. And for convenience we’re going to use one of the samples provided in the DFS SDK; <DFS SDK install dir>/samples/HelloWorldService. All we need to do is navigate to <DFS SDK install dir/samples/HelloWorldService/src/service folder and copy the top level folder of the source tree, “com” in this case. 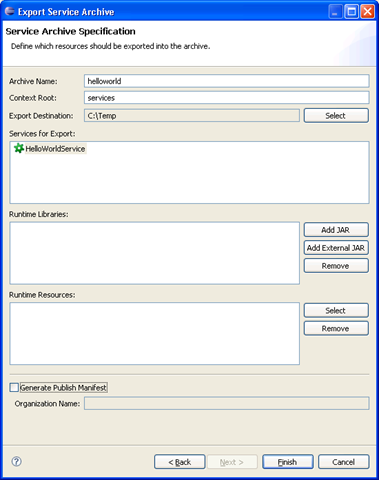 Then paste it into the the /Web Services/src folder of your Documentum project. And just so you know the DFS Builder does support incremental builds and will only rebuild services that have changed since the last build so it should be reasonably efficient. So now we’ve reached the point where we have a service that needs testing. There are two approaches to this. 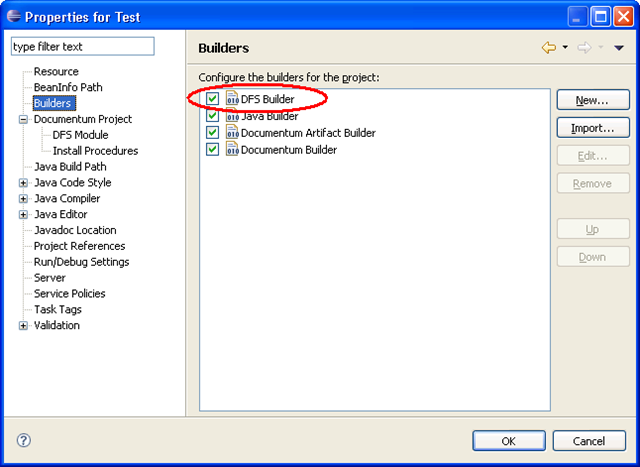 The first is to create a parallel test project with Junit tests that exercise your service. To facilitate this your test project would be configured with the local client library, as described above, so that it can make local invocations to your service. This project should of course be placed under the same version control as your services project. The archive name and context root should be defaulted for you from your DFS Module settings page. Choose an output folder. Uncheck the Generate Publish Manifest. This is only required is you want to publish your services to a UDDI registry using the DFS tools. And click finish. This will produce your ear file. Once you are in possession of the ear you can deploy it onto your app server using the appropriate app manager console or by dropping it into the hot deploy folder. Whichever works for you. Once you have it deployed you can perform a quick sanity check by requesting the service’s WSDL document by requesting something like http://localhost:8080/services/helloworld/HelloWorldService?wsdl. Assuming you get back the WSDL document (that matches the one that was generated by the builder earlier) then you are good to go. Next you will need to create yourself another test project. But this time configure it with one of the two available Remote Client library options, depending on your content transfer requirements. Again, creating Junit test cases I find is the quickest and easiest. 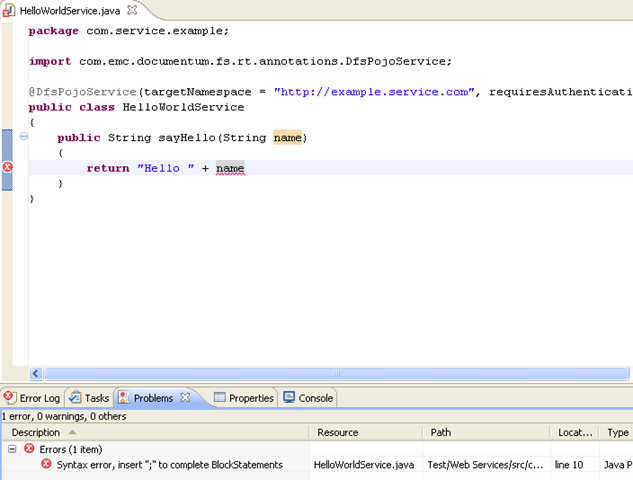 These can be rolled up into test suites and all can be invoked easily enough through the Composer (eclipse) UI. And once again, if you can standardize this process across your development team then you can check this test project into source control right along side your services project. In summary we have walked through the out-of-the-box capabilities of a Documentum project with respect to creating DFS services. Every Documentum project has the capability to host the development and testing of DFS services. There are four libraries that are at your disposal for development and testing. Each project has an incremental builder that is capable of automatically building your services. And finally there is an exporter that can produce an ear file containing your services that is ready for deployment onto any app server. Looking forward, in future articles I will talk more about another development option which leverages both Composer’s and WTP’s capabilities. This option gives you far greater control over the contents of your ear and brings remote debugging of your services to your IDE. In the meantime, happy Composing.